This tomb, which is situated at the southeastern corner of the Valley, at the end of a narrow pathway, belongs to another son1 o Ramses III. He too died too young to pass into the presence o gods of the underworld unaccompanied and it is Ramses " introduces him to them. The tomb was never completed and so of the undecorated white plaster coating can be seen. The first corridor (I) is decorated on both sides with representations of the king introducing his son to the different gods and goddesses. It is in the two side chambers, however, that we find the most interesting scenes. Since they are similarly decorated, only one will be described. In the right-hand chamber (2), on either side of the doorway, are the goddesses Isis and Nephthys on one side, and Neith and Selket on the other. Moving clockwise, the left-hand wall (a) shows the young prince standing alone adoring four demi-gods in turn. The first one is Hapi the Nile-god who has been given a jackal head by mistake! 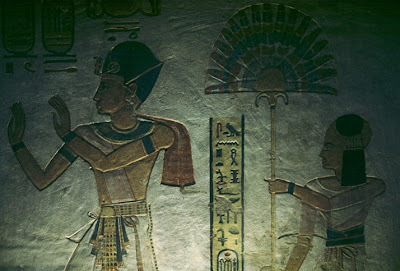 On the rear wall (b) Isis and Nephthys talk to two seated figures of Osiris on behalf of the prince. On the right- hand wall (c) the prince worships four more demi-gods; Duamutef has here been given the head of an ape instead of a jackal! The long corridor (j), which is vaulted and decorated with scenes to right and left, once again shows Ramses introducing his son to demi-gods. In the rear chamber, however, Ramses III stands alone before the gods interceding for his son. The rear wall (d) repeats the scenes of the four goddesses addressing Osiris. Selket and Nephthys to the right, Isis and Neith to the left. From a lotus flower in front of Osiris, four genii arise.